Thorin and Bilbo in Mirkwood. Courtesy of the folks at RichardArmitageNet, we have four new, exciting movie stills from the 2014 The Hobbit The Desolation of Smaug Wall Calendar to have a look at. 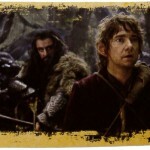 Lots of Thorin Oakenshield, of course, but we also Bilbo and Nori in these images. I do wonder whether the one that appears to be in Mirkwood Forest with Thorin shaping to fire an arrow could be a scene involving the White Stag that the Company unsuccessfully hunts in the book. Thorin in the ruins of Dale. Thorin escapes the Elven-king’s halls.